My husband and I had the pleasure of seeing Disney Pixar's UP on the big screen with our kindergartner. I was very pleased to find that the film was just as captivating on the small screen. I was also curious as to how our twin toddlers would react to this 96 minute film. This film is centered around the character Carl Fredricksen (played by Ed Asner). Mr. Fredricksen and his wife were two adventurers who fell in love at a young age and lived a long happy life together, but never had children of their own. After becoming a widower, Fredricksen changes his plans of living out his days quietly and alone. Instead he decides to move to Paradise Falls . . . a dream he and his wife once shared. That is how his adventure begins. 1) There are many concepts introduced in this movie that you can discuss with your children, such as the actualization of dreams, the idea of soul mates, real life role models vs. famous role models, selflessness, loyalty, and friendship. 2) Every character seems to have a key part in the film. All the characters were developed so well that none of them seemed to be expendable. 3) Mr. Fredricksen, Ellie (Fredricksen's wife), Russell (the 8yr old boy), Kevin (the bird), Dug (the dog), and even antagonist Charles Muntz and his pack of dogs were all endearing characters. My kindergartner's favorite character was Dug. We are dog lovers in our family and Dug's loyalty, big heart, and vulnerability won us all over immediately. 4) Amongst the many bonus features, my family's favorites are the "Cloudy with a Chance of Meatballs" short and "Dug's Special Mission". 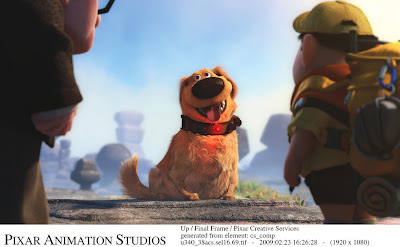 The latter is very cleverly written to show what the dog Dug is experiencing while he is apart from Mr. Fredricksen and Russell. Here is a clip from "Dug's Special Mission" . . . 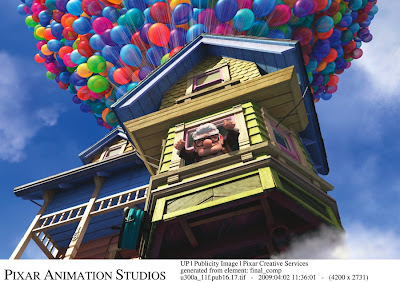 If you are only able to purchase one movie before the year is out, I think it should definitely be Disney Pixar's UP. The adventure these engaging characters embark upon are entertaining for viewers of all ages. Although our nearly 3yr old twins were not able to sit through the entire 96 minutes, they did enjoy many parts of the movie. 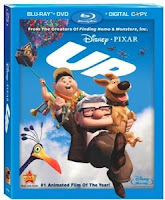 You should be able to find Disney Pixar's UP on Blu-ray/DVD at the Disney Store and most places where Disney movies are sold.